So many of their friends have their own ideas about the right length of time for grief and mourning. Those friends freely make their opinions known to those who are bereaved or suffering from other life losses. Clients will verbalize concern that they are taking too long or not grieving long or “hard enough” to satisfy others in their lives. My answer is, “As long as it takes,” provided that complications have not developed. For usual and customary grieving, there is no right amount of time and no particular “right” way to grieve. 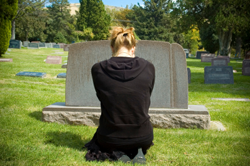 Many people wonder just what they should be doing in the way of mourning. We expect people who have suffered losses to feel sad, angry, frightened, and possibly guilty or even feel ashamed. They may find themselves crying, sighing, confused, unable to concentrate and lacking in motivation to do much. They may be constantly thinking of their lost or seriously ill loved one or other loss condition, may withdraw from much contact with others, or want a lot of company and find no appetite or can’t stop eating. Many want to sleep most of the time while others can’t fall asleep or stay asleep. It can vary greatly from individual to individual and from family to family. This is what we humans do. All of the above feelings, mental functioning and behaviors are natural reactions to loss or the threat of loss. They are influenced by the life history of the mourner, the traditions regarding death and illness derived from their respective families and cultures. The type and features and cause of the loss influence the nature of the human grief reaction and its intensity. For example – loss of a parent, child, spouse, pet, home or job; homicide, suicide, war and other sudden, violent, unexpected loss vs. lingering loss – each can have unique effects. Grieving is an ancient human response designed to facilitate survival. Our need to initially attach to a mother for food, warmth and safety creates the distress at losing the attachment to later significant bonds. Long before the efforts to develop scientific theories to explain how and why we grieve, bereaved people developed rituals and practices associated with death and dying. Burial sites and buried items included with the dead, cave wall paintings and various chants, dance and prayers yield testimony to the reactions to loss throughout human history. This is what we humans do when faced with loss or the threat of loss, and has been around for a long, long time. A man came to see me because he was still devastated by his loss eight months after his son’s death. Eight months is not really much time and for most, the natural devastation can last much longer. For many people, there is an adjustment to the many, many losses that are connected to the primary loss. The timing of this adjustment is very individual and can be aided by the support of others. We may find that there are times when our grief is upon us and refuses to leave. While at other times we may feel lighter, less pulled down and able to carry on with every-day life requirements. This is normal. Some like to think about “grief recovery” and how we help this to happen. If “recovery” means returning to life as it was before the death or other permanent loss, then the expectation is unrealistic. If “recovery” means reclaiming a functional life in the post-loss world, then we can hopefully look forward to a period of steady adjustments to a new life in a changed world. This article was first published in “Living with Loss,” Summer 2010. John Shep Jeffreys, Ed.D., F.T., is a licensed psychologist with a practice specializing in grief, loss, and end-of-life concerns; a Certified Group Psychotherapist, and a Diplomate in Family Psychology. He is Assistant Professor of Psychiatry and Behavioral Sciences at Johns Hopkins University School of Medicine, where he provides seminars on loss, grief and bereavement for psychiatric residents and medical students; and is Affiliate Assistant Professor of pastoral counseling, Loyola University, Maryland, where he teaches the Loss and Bereavement course. He is on the staff of the Department of Psychiatry, Howard County General Hospital. He has served as trainer and workshop leader with Elisabeth Kubler-Ross in the United States, Canada, and overseas, and as consulting psychologist for the Johns Hopkins AIDS Service. Shep has worked as individual and group psychotherapist and clinical supervisor in both outpatient and inpatient psychiatric settings. He serves as staff development consultant and trainer for hospices, hospitals, nursing homes, educational and religious organizations, and corporations. Shep is a frequent speaker at his local Bereaved Parents USA chapter. He is a spiritual leader in his community and also serves as chaplain on call at Howard County General Hospital. He has spoken locally and nationally and has authored several books and articles for various publications. In his consultation service, Shep has assisted organizations dealing with the aftermath of 9-11 (both private corporations as well as the New York City Fire Department’s HazMat first responders). Further, he is called upon to assist employees with the grief and loss consequences of organizational downsizing and other change; and also provides grief counseling and group support for workplace co-worker and/or family death and serious illness. He is author of Helping Grieving People–When Tears Are Not Enough: A Handbook For Care Providers; and of Coping With Workplace Grief: Dealing With, Loss, Trauma and Change. His column, Grief Psychologist’s Corner, is a regular feature in Living With Loss magazine. After the death of his son, Steven, from cancer, his family formed the Steven Daniel Jeffreys Foundation, which has provided such programs as: grief counseling, workshops, community education, children’s groups and a referral service. He is married, has two surviving children and five grandchildren. Shep can be found on the web at GriefCareProvider.com and Griefcast.com (Audio podcast). Twin not dead but lost. At age 16 my twin decided he hated/despised me. That was about 1963. It hurt for decades. Later, when my mother died, my twin joined my other sibling to financially abuse me thru probate; my twin had abused me as a child, and this was the replay. Finally, I had to decide never to speak either to my twin or my other brother—-but it still hurts. After 50 years of hurting, it’s pretty clear it’ll keep hurting tho it is more blunted now. I have a relationship with each of their children (to whom they’re not particularly close).. I wish it would end, but I know it will not.